Amnesty International set the challenge of how they could leverage social media to create a debate confronting issues around internet censorship in China, which would educate and engage online communities. There were hard metrics set in terms of benchmarks and volume of conversations that would demonstrate share of voice and share of mind. Further benchmarks included the number of content pieces published and the number of resultant actions, such as signing up to the Amnesty International Chinese Internet Facebook cause, driving traffic to the uncensor.com.au campaign web-site, joining the online Day of Protest and attending the Tear Down The Great Firewall of China protest in Martin Place, Sydney. Pre-campaign we monitored the internet conversations about the issues and about Amnesty International Australia, in general and in context of the Chinese government’s Internet censorship policies. With just 47 posts and 1,250 Facebook members in June prior to the campaign starting, and a timeline forcing a fast-to-market approach, we needed to create a highly effective strategy and implementation plan. Peter Buckmaster from Care Network was appointed project manager, with Fi Bendall, from Bendalls Group on content creation and community engagement, Katy Woodrow-Hill from dgmAustralia in charge of content optimisation and distribution. It was important that any content we created was relevant and would generate a response. There was a requirement given a three week campaign time frame that the information needed to go viral, and fast. We also wanted to incorporate into the campaign the campaign web-site www.uncensor.com.au with the blog badges and flags available there for people to download to their own site. As opposed to taking a highly creative approach, we launched three written content pieces that were devised for the general online communities and re-edited specifically for the blogging community. We know that there is general interest in any new social media campaigns, so the first piece was a release announcing the Amnesty International Australia social media campaign launch. It confronted technology companies, such as Google, Yahoo! and Microsoft on the assistance they provided to the Chinese government’s Internet censorship regime and introduced Australia’s online community to the campaign that we were calling them to get behind. While this piece was launched, we also commenced a blog community engagement strategy. We did this by contacting some key influential bloggers to ask for their feedback to the campaign proposal and for their recommendation of us to other bloggers who we felt would be interested in the campaign. The second content piece was a call to the Australian online community to “have their say” about the issues. At this time we also issued FAQs to the blog community, pasted code for blog badges and flags to save the bloggers having to download anything and started to push the content out by engaging and chatting within social networks, twitter and so on. We followed key rules: we asked if people were interested and we were always upfront about who we were and what we were doing for Amnesty International. By the time the third content piece went out, which was an e-invite to the Tear Down The Great Firewall of China action in Martin Place, Sydney, the online community buzz was highly visible and many online generalists and bloggers were supporting the campaign. There was online visible debate, posts about the campaigns issue, campaign content being used and passed around the web. 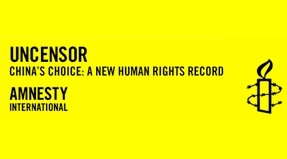 In addition, we went out of our way to provide access to Amnesty International Australia spokesperson, Sophie Peer to the blog community and a number of successful blog interviews were recorded. One top Aussie blogger, Neerav Bhatt even donated $500 to the campaign! The campaign drew to a close the day before the Olympics commenced. The results recorded make this social media campaign one of the most successful in market and shows how highly effective social media can be as a communication tool if you take time to understand and engage the online influencers and ask for help, while being sensitive to what the online audience want to talk about and engage with, rather than making presumptions. When the International press started to complain about Internet Censorship in China prior to the Olympics starting, Amnesty International’s content was consistently appearing on the first page of Google and Yahoo across a range of keywords.